Hartwick Pines is not only the largest state park in the Lower Peninsula but it was also one of the first in northern Michigan to welcome mountain bikers when in the late 1980s it opened up its 10-mile network of ski trails to off-road cycling. At first two-wheelers came in groves. But eventually their numbers tapered off partly because so many other mountain biking areas became available including Hanson Hills in Grayling and Aspen Park just to the north in Gaylord. Others bypassed Hartwick Pines because its trail system is mostly old logging roads and not technical enough for many off-road enthusiasts. But don't let the lack of narrow single track stop you from leaving I-75 for an easy but intriguing ride in the woods. 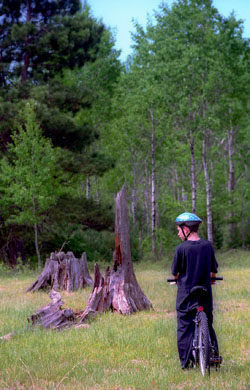 Accessed from the Michigan Forest Visitors Center, the mountain bike trails are located north of the park’s famous 49-acre tract of virgin white pine. Although the area was logged at the turn-of-the-century, the pines that replaced them are still impressive while in the middle are vast stump fields. The result of turn-of-the-century logging, the fields are now semi-open meadows where 50 or more relic stumps scattered all about like a cemetery devoted to giant white pine. It's an eerie feeling to ride through the middle of these grayish, ghost forests and see the handiwork of lumberjacks from more than a century ago, especially if you thought every pine in the park was a 300-year-old tree. Hartwick Pines’ ski/bike system is basically a 7.5-mile loop with two crossover spurs to form three different routes. 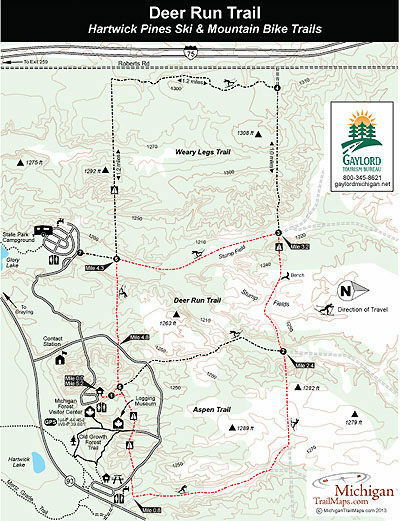 From the Michigan Forest Visitor Center trailhead, the Aspen Trail is an easy 3.5-mile loop, Deer Run Trail is 5.2 miles and Weary Legs Trail is 7.5 miles. Both Deer Run and weary Legs contain more hills and greater changes of elevation but the entire trail system is rated easy/moderate and presents few problems to mountain bikers. All three loops are followed in a counter-clockwise direction. The most interesting loop by far, and the one described here, is Deer Run Trail as it takes you into the heart of the stump fields. All three trails are well marked and easy to follow with numbered posts and maps at all junctions. It's important to remember that the other trails in the park; Au Sable Trail, Mertz Grade Trail and the Old Growth Forest Trail that winds through the logging camp interpretive area, is off limits to mountain bikers. 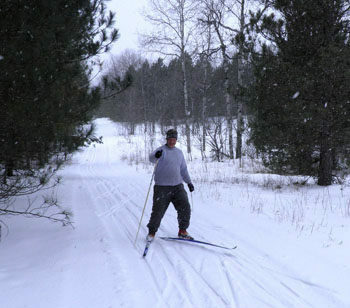 When there is sufficient snow in the winter, the trails are open to cross-country skiers. Trails are usually rolled and set with tracks for classic skiing and throughout the winter night skiing is offered on a regular basis with part of the system being lit by lanterns. None of the loops are overly difficult like what you’ll find just to north at Forbush Corners as the hills you encounter are moderate with straight downhill runs. The trailhead is located at the west end of the visitors center parking lot and well marked. It heads into the woods and immediately you pass post No. 1 and then reach a junction with the main loop. Whether you skiing or biking head east (right) to follow the loops in a counter-clockwise direction. A hill is encounter and bottoms out at the junction with the Old Growth Forest Trail, the paved path that winds through the Hartwick Pines Logging Museum complex and the tract of old growth white pine. At Mile 0.7 you pop out on the park road briefly and then leave the road at a junction marked with a mountain bike sign. Shortly the loop swings north onto an old two-track and then just before Mile 2 trail signs direct you to the west. The terrain becomes more rolling before you reach post No. 2 at Mile 2.4 and beyond it you enter a stump field. At one point you climb a slight rise to a bench where you can take a break to stare at a sea of stumps and imagine what the forest must have been like before the lumberjacks arrived. Post No. 3 is reached at Mile 3.2. Head south (left) to continue with the Deer Run Trail. You immediately enter another stump field, a place that is even more eerie when there is a light rain or snowfall. Deer Run Trail continues to follow an old two track through a valley of stumps before moving back into second growth pines and arriving at Post. 5 at Mile 4.3. Head east (left). The terrain becomes more hilly including a long climb after you cross the park road (unplowed in the winter). Post No. 6 is reached just after Mile 5 and here you head south (right) to pop out in the visitor center parking area in less than a quarter mile. During the winter the Michigan Forest Visitors Center doubles as a warming area for skiers with heated restrooms and drinking water. The park is open year-round and from September through May the Michigan Forest Visitors Center is open daily 9 a.m. to 4 p.m., excluding the Thanksgiving and Christmas holidays. From 1-75, north of Grayling, depart at exit 259 and head north on M-93 for 3 miles to the park entrance. The cross-country ski/mountain bike trail head is clearly marked on the west side of the parking area for the Michigan Forest Visitors Center. You can call the park headquarters or the visitors center (989-348-2537) in regards to snow conditions, grooming and night skiing and other special events.